Archive for the ‘Topic’ Category. This is another post that looks both at the year in review and at the coming year. 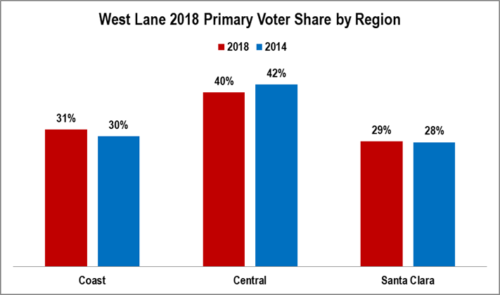 There is an interesting pattern across the past three mayors: Ruth Bascom (1993-7), Jim Torrey (1997-2005), and Kitty Piercy (2005-present). Under Bascom the library lost narrowly … very narrowly. Under Torrey the library won in landslides … every win by more than double digits. Under Piercy the library won … but only narrowly. Both wins were solid, but not overwhelming by any stretch of the imagination. 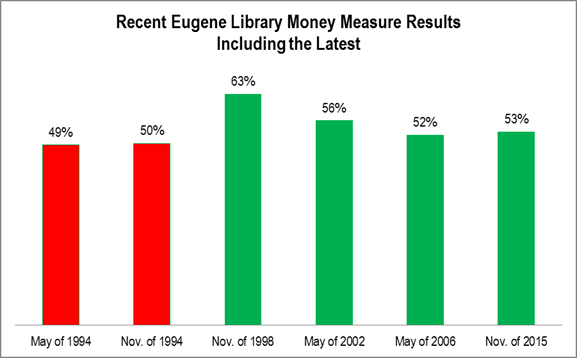 May 1994: General Obligation Bonds for new library, emergency equipment, facility repair – $56,207,287. Despite the dramatic turnout increases, there was relatively little change in the geographic distribution of voters. 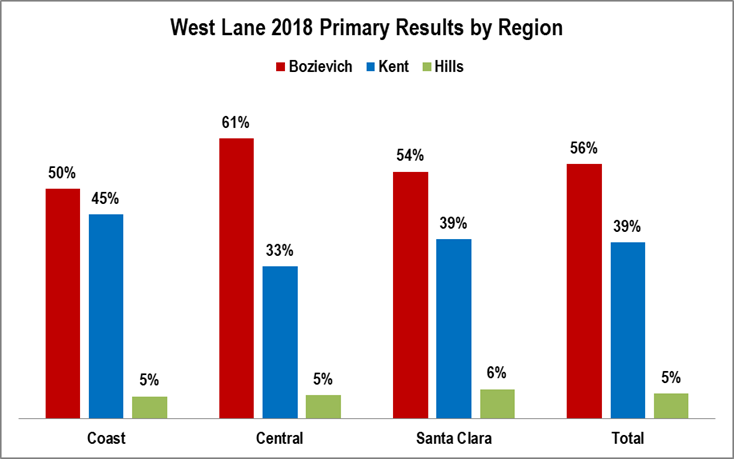 The biggest shift, a 3% decrease, was in the Valley region. Valley: Unincorporated portions of the district. Turnout increased dramatically compared to 2014 in every region. 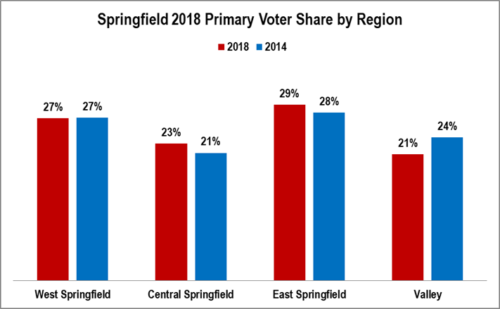 This reflects Springfield’s growth. The one laggard, but, only in comparison, was the Valley region. 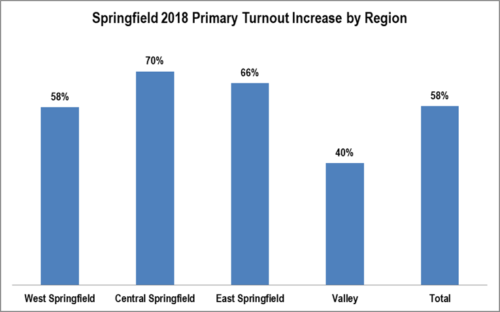 Though there were turnout increases in every region, they had very little effect on the distribution of actual voters in the election. Coast: Precincts 702, 704, 4500, 4601 and 4602 (merged with 4601 after 2014 election). Central: Precincts 706, 708, 710, 712, 714, 716, 4700 and 4900. Santa Clara: Precincts 726, 732, 1569, 1671, 1781 and 1787. 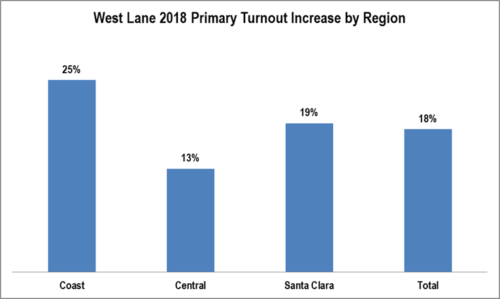 Turnout increased in every region of the West Lane district compared to 2014. The greatest increase was in the Coast region. 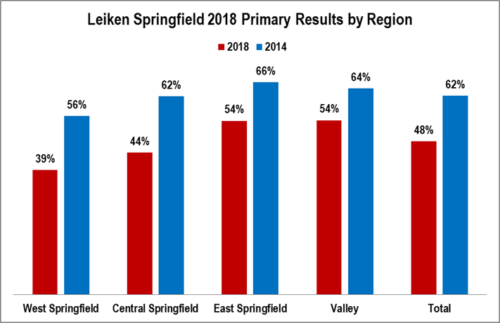 Leiken’s support dropped in every region of the district since his 2014. 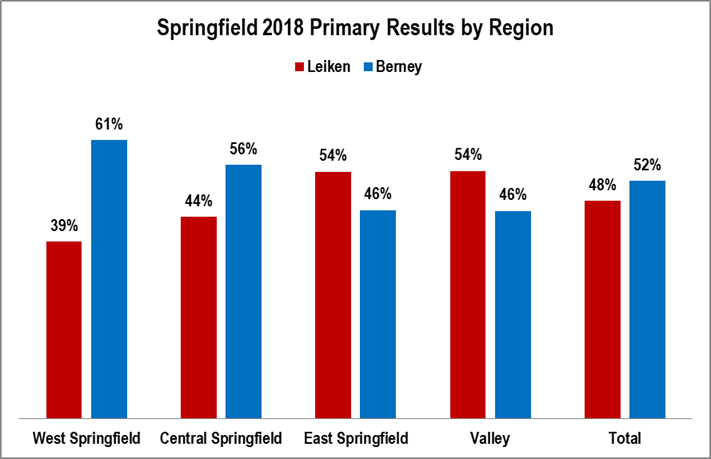 The greatest drops were the in the areas where Berney did best. Berney did better the further west in the district one went. The generally more affluent end of the district supported Leiken. 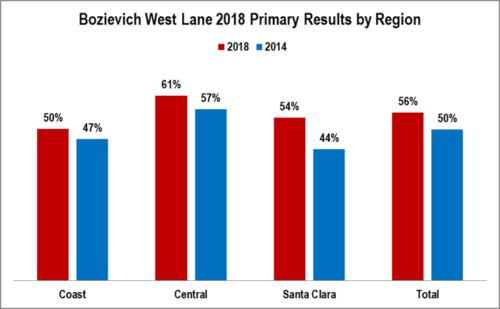 Bozievich improved in all regions in comparison to his nail-biting recount victory in the 2014 Primary. His greatest improvement was in the urban Santa Clara area. Bozievich won all three major regions of the district, but he really piled up his margin of victory in the Central region. The Coast region, unsurprisingly, was the closest and where Kent did best.